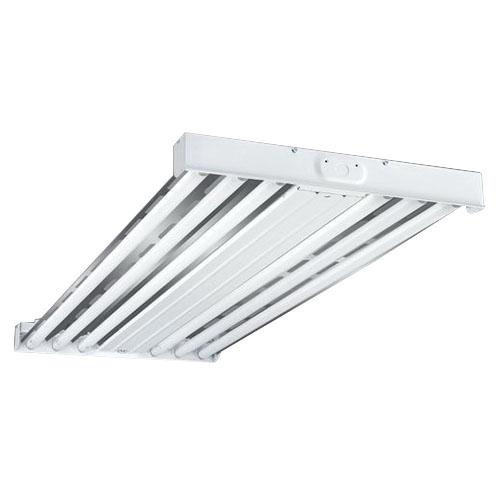 Cooper Lighting Metalux™ F-Bay Collection HBL Series Linear high bay industrial open luminaire in baked white enamel finish, features die formed steel channel and end plates. It accommodates six 32-Watt T8 lamps with twist-lock socket. Lamp with electronic instant start ballast, has voltage rating of 120 - 277 Volt. Lamp has frequency rating of 50/60-Hz. It withstands temperature rating of 55 deg C. Suspension mountable luminaire measures 48-Inch x 19-17/32-Inch x 2-15/32-Inch. It is suitable for use in retail, shopping malls, light industrial and recreational environments. Luminaire is UL/cUL listed.